The album A Valid Path, Alan’s foray into electronica was released in 2004 and featured Pink Floyd’s David Gilmour, The Crystal Method, Shpongle, Uberzone, P.J. Olsson and Alan’s son, Jeremy. 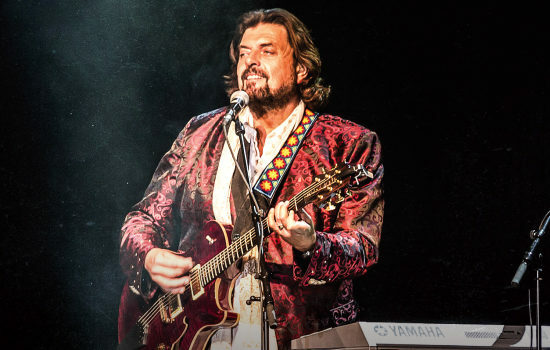 2008 saw the reissue of all the Alan Parsons Project albums in expanded form, containing never-before-heard bonus material and a 2-CD compilation called The Essential Collection. One of the most familiar Project tracks is Sirius, perhaps best known as the Chicago Bulls theme. It was also used as the walk-on music for The New Orleans Saints at their triumphant Super Bowl game in 2010 and at the 2012 European Cup soccer matches. Sirius has also been featured at countless other sporting events, commercials and in the movies Cloudy With A Chance Of Meatballs and Beerfest. In 2010, Alan felt the need to share his extensive knowledge and expertise with the rest of the music industry. With the help of fellow Brit Julian Colbeck, Alan wrote and produced a comprehensive instructional video series about recording called The Art & Science Of Sound Recording (ASSR). It features contributions from a myriad of celebrity artists, engineers and producers and is narrated by Billy Bob Thornton. There is also a companion book. See www.artandscienceofsound.com. All Our Yesterdays, a song written especially for the series, features some of LA’s finest musicians and a rare performance by Alan on lead vocals. Alan has been supporting ASSR with a series of lectures and Master Class Training Sessions (MCTS) all over the world. It has been a great opportunity for the attendees to witness Alan at work in the studio and to participate actively in the making of a possible future hit. Since the beginning of 2012, as well as performing live shows, Alan has kept busy in the studio doing vocals for German Electronica outfit, Lichtmond, and with YES stars Billy Sherwood and Chris Squire as The Prog Collective. Other collaborations have been with Mexican superstar Aleks Syntek, and celebrated Israeli singer/songwriter Aviv Geffen. Alan produced an album called Grand Ukulele with Jake Shimabukoro, the virtuoso ukulele player, whose YouTube video of “While My Guitar Gently Weeps” has received over 10 million hits. The album contains a number of orchestral arrangements by Winger frontman, Kip Winger. A collaboration with Steven Wilson as engineer and associate producer resulted in major success including a Top 5 album in Germany with The Raven That Refused To Sing in 2013. A CD box set of all the Alan Parsons Projects was released in March 2014 and included a controversial never previously released CD from 1979 entitled The Sicilian Defence. In the summer of 2016 Alan released a video on Blu-ray and DVD, and audio in both stereo and 5.1 Surround of a major concert event in Medellin Columbia, featuring a 70-piece symphony orchestra. Both Tales of Mystery and Imagination and Eye in the Sky have been re-released on vinyl at 45 rpm (12” record size). Both albums have been released in anniversary box sets, including vinyl, original and bonus CDs, and include 5.1 Surround mixes on Blu-ray. Alan has been leading the way regarding technology, blending tech with art for his craft as a recording engineer and producer-performer. Compiling years of expertise into his book (and DVD set), “The Art & Science of Sound Recording, he has created a work unlike anything else available in the marketplace. 2018 brings a special opportunity to the public March 24 and 25. Alan leads an intensive Master Class weekend workshop along with Grammy Award winning arranger (and one of Alan’s band members) Tom Brooks, at Hybrid Studios in Santa Ana, CA, which includes a full symphony orchestra. Participating in the intensive will be session greats Vinnie Colaiuta, Nathan East and Jeff Kollman. The track, an orchestral classic, is being given the Prog Rock treatment and will actually appear on Alan’s next album. Alan is not only in the middle of recording that album, he’s doing it on his brand-new all analogue Neve 5088 console, at his new state-of-the-art recording studio. Believing in giving back to his community, Alan donated all proceeds from his Chumash Casino concert to benefit first responders and local organizations serving Thomas Flood victims and first responders. But his generosity doesn’t stop there. Alan helped to spearhead the One 805 KICK ASH BASH benefit event that further supports first responders and Montecito fire and flood victims. Raising over $2 million, the celebrity appearance list included Dennis Miller (emcee), Ellen DeGeneres, Jane Seymour, Michael Keaton, David Foster, Don Johnson, musical performances by Alan Parsons, Katie Perry, Wilson Philips, David Crosby, Steve Vai, Katharine McPhee, Richard Marx, The Sisterhood Band, Glen Phillips, Steve Vai, Dishwalla and many others. Exercising his family genes in acting, (cousin to noted actor Oliver Reed), Alan will be immortalized as a cartoon-ized version of himself in the “Yacht Rocky” episode of the long-running, mega-hit animated TV series, “Family Guy.” Air date will be sometime in 2019. Alan’s longtime hobby has been performing magic, and he regularly attends the legendary Magic Castle in Hollywood where he is a magician member. Alan has two sons, Jeremy and Daniel, from his first marriage – both living in the UK. Alan now lives on an organic avocado ranch in Santa Barbara, California with his wife Lisa and her two daughters, Tabitha and Brittni, dogs, cats, chickens and an 18-hand Clydesdale called Dante.